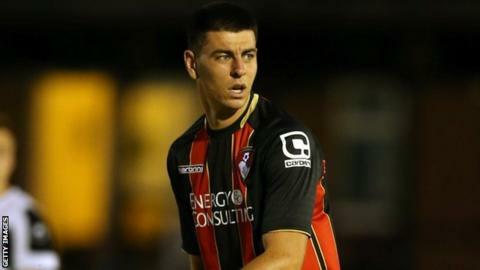 AFC Bournemouth striker Joe Quigley and Lincoln City midfielder Jon Nolan have joined National League side Wrexham on loan. Quigley, 18, has joined on an initial one-month loan and 23-year-old Nolan is scheduled to stay with the Dragons until January. Nolan joined Lincoln from Stockport County in 2013 while Quigley spent a loan spell at Torquay United earlier this season. Manager Gary Mills hopes both players will be available for Saturday's derby at Chester, subject to international clearance. "They're two good signings for us," Mills told BBC Wales Sport. "Joe did extremely well against us for Torquay and he's been on our radar since that game. "Fortunately for us he had gone back from Torquay to Bournemouth and was available."